Does Game of Thrones season 7 have a MAJOR reunion in store? Hold onto your hats, because we’ve just heard the kind of major Game of Thrones spoilers that we’ve been waiting the entire series for. Of course, this article could contain major possible spoilers (but also maybe not, because nothing is confirmed). The new information is all thanks to those probably-quite-annoying-to-HBO paparazzi snapshots that keep emerging on the internet. In past years, paparazzi revealed the true fate of Jon Snow (alive!) and also the returns of numerous long-lost characters. Right, if you’re still here, then be it on your own head. Arya actor Maisie Williams has been spotted wearing Northern clothing on the same day as other actors known to be shooting scenes in the North, such as Kit Harington (Jon Snow). That’s not all – she was sharing a make-up trailer with her on-screen brother Isaac Hempstead-Wright, who portrays Bran, that same day. 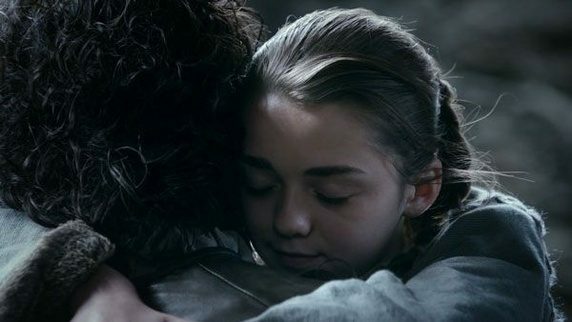 Arya and Bran are the only remaining estranged members of the beleaguered Stark family, after Jon and Sansa reunited last season and Rickon met a cruel end. When we last saw her, Arya was revelling in delight in her murder of long-time enemy Walder Frey. Meanwhile, Bran was making a game-changing discovery about Jon. It was unclear then what either of the pair’s immediate plans are, but it made sense for Bran to travel North to tell Jon the truth about his heritage. Arya is more of a loose cannon, and some fans speculated she may go in search of revenge before returning to her ancestral home. Now, the new pictures suggest both siblings may return home. 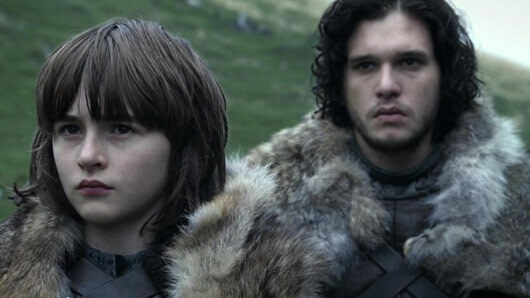 Could we be looking at a full Stark reunion in 2017? We’re filled with both excitement and fear. This is Game of Thrones, if the moment we’ve been waiting for since season one, episode two does come to pass – we can be absolutely certain that something horrible will happen to balance it all out again. Another mass family massacre, perhaps? Game of Thrones returns in summer 2017. « Could Fatboy make a shock return to EastEnders?